So, Level Up Book Club, how's your super chillaxed, uber stress-free month of December, going? That's what I thought! You're swamped! Overwhelmed! Counting the seconds days till winter break! No need to stress about challenges or leader boards this month, just pick up your copy of this amazing book and start reading. Easy Peasy. Over the next couple of weeks, we'll start posting quotes from the book and sharing our thoughts. Then, once January hits, when we're all feeling rested and renewed, we'll hit the ground running in preparation for our next #levelupbc Twitter chat. In the meantime, feel free to make Level Up and Bissell's book your happy place during this hectic and chaotic time. And... if you're still waiting for your copy to come in at the public library OR you're hoping Santa will tuck one in your stocking, no worries! Here's an interview with the author to tide you over! Wait a second... did you do this? Guild, this is AWESOME! 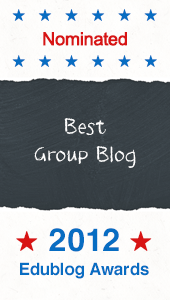 Thank you so much for helping the Level Up Book Club get recognized for not one but three Edublog Awards! Level Up is nominated in the categories Best Group Blog, Best New Blog, and Best Edu Social Network. And ya know what? We totally deserve it! This book club is super fun because of the gamers, educators, and innovators that you are! We quest together. We explore together. We achieve together. What's not to love?! Now it's time to see if the Level Up Book Club can bring home the bacon. 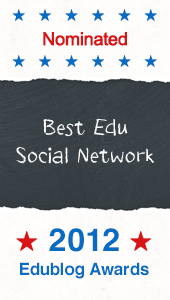 Voting for the Edublog Awards is open until 11:59pm EST on Sunday, December 9th. You can vote daily and from multiple devices. And, most importunely, each vote counts. Go to the Edublog Awards voting page and let your voice be heard. Tweet the link. Promote Level Up. Coerce your colleagues to vote for us. You could even make a game out of it! We're gonna wear these badges loud and proud! Thanks for being part of this truly epic win! On behalf of the FAUXasis Gaming Board, I, Matthew Winner, FAUXasis lead designer and programmer, would like to congratulate user LIBRARYFANATIC as the winner of the Level Up Book Club Season 2 Side Quest. Despite competition from thousands of challengers globally, LIBRARYFANATIC has demonstrated the commitment, capacity, and merit to earn the coveted FAUXasis PRIZE. Said PRIZE will be sent via post to the undisclosed home of LIBRARYFANATIC where it will no doubt garner the attention and wordwide acclaim deserved of the competitor him- or herself. The Board would also like to recognize those players who have endured the 10 FAUXasis modules over the recents weeks. You have each exhibited excellent sportsmanship and endurance through mental and physical challenges. The Board hopes you have enjoyed reading Ernest Cline's READY PLAYER ONE as well as your time spent in the company of the Level Up Book Club. All FAUXasis accounts will be terminated shortly and the modules permanently dismantled, but records of all accounts can still be accessed through the Level Up Book Club server. Thank you again for playing. We hope you have enjoyed the experience.